The Apple HomePod offers some of the best-sounding audio available in the smart speaker market, and it lets you read and send text messages by voice using Siri. Since it's got those features, you might expect that the HomePod is also a great device for making phone calls, right? Yes, mostly. The HomePod can be a useful part of phone calls, especially when you need to keep your hands free while still wanting to talk (HomePod makes it easy to cook dinner and chat at the same time, for instance). It doesn't work entirely how you might expect, though. Read on to discover the HomePod's phone-related limitations and how to use it with phone calls. When it comes to using the HomePod for phone calls, there's one major, annoying limitation: you can't actually place phone calls on the HomePod. Unlike for text messages, which you can read and send on the HomePod just by speaking to Siri, you can't start a phone call via Siri. So, there's no option to just say "Hey Siri, call mom" and start speaking to your mother. Instead, you must start a phone call on your iPhone and then switch the audio output to the HomePod. When you do this, you'll hear the phone call coming from the HomePod and will be able to talk to it like any other speakerphone. Given that other smart speakers allow you to place calls by voice, this is a frustrating limitation. Here's hoping Apple eventually adds a calling feature to the HomePod. Once the call has started, tap the Audio button. In the menu that pops up from the bottom of the screen, tap the name of your HomePod. When the call is switched to the HomePod, an icon of the HomePod will appear in the Audio button and you'll hear the call audio coming from the HomePod. Because you can't use Siri to place calls, you also can't use it to end the call either. Instead, you can either tap the red phone icon on the iPhone's screen or tap the top of the HomePod. End the current call and switch to the new one: Touch and hold on the green light on top of the HomePod. 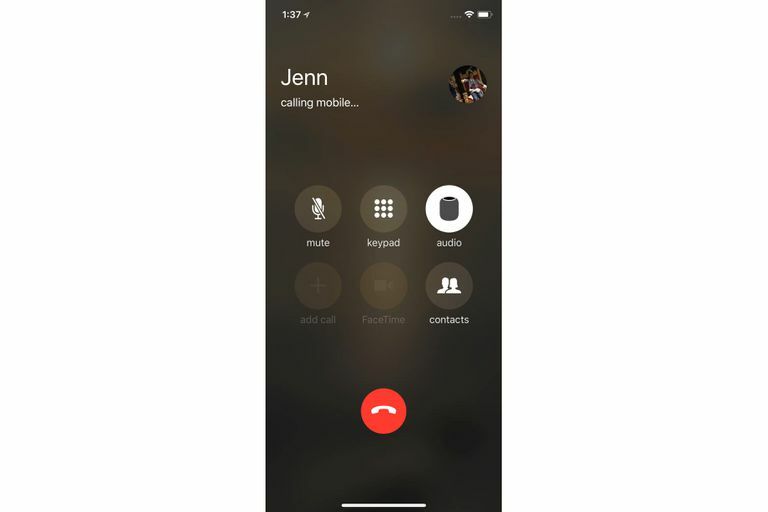 Answer the new call and put the current call on hold: Tap the green light on top of the HomePod. Switch between calls: Tap the top of the HomePod.